My sibling, aunt, cousins and I had a few minutes of brainstorming where it’s best to spend our Sunday. We need to go somewhere rather than bore ourselves sitting around all day in front of several screens: computer, laptop, tablet smartphone. Several malls were thrown out as a suggestion but didn’t quite appeal because we wanted something different to do. So when Tagaytay was suggested, without further ado, we prepared ourselves for an adventure. Good thing commuting to and from Tagaytay has been easier and more flexible. It was around 1PM when we left home. We rode cab, tricycles, jeepneys and buses to travel. Our first stop was the ever popular destination: People’s Park in the Sky. After paying an entrance fee of P30, we are free to roam around and feel nostalgic. We’ve been here before and our accompanions were different, now it was a new memory. The weather wasn’t that cold yet. My aunt armed herself with her iPhone camera to capture moments with her nephews. Picture dito, picture doon. It was like we never miss a corner without a dozen of photos. We ate donuts and snacks then drank bottled juice. We also window shopped on the local souvenir shops, prayed to Mama Mary on the grotto, and made a wish then threw coins on the wishing well, had a pose with a celebrity donkey and a big human-built pineapple. There were still lots of people in this place and it is going to be for decades to come. Hopefully the caretaker of the People’s Park use the collected entrance fees for maintenance, improvement and development the place. Our next location was a new tourist attraction Sky Ranch. I said it was new because it was our first time here. The first thing I noticed from afar was the Sky Eye because of its collosal size. While I was walking on the sidewalk, I saw how this placed was densely packed with people of all ages. Some were taking endless selfies like us, some were eating on fancy restaurants, some were being happy on the rides, and some were just sitting on the benches. There was an admission fee of Php 100 and the payment for the each ride ranges from Php 100 to 250. They don’t have a ride-all-you-can package option. Well, we decided not to admit because it was also another amusement park like Enchanted Kingdom or Star City and it was no better. We left the place after a while then headed to Summit Ridge Promenade for another window shopping. The weather has gotten colder by now. The mass at Our Lady of Lourdes Parish Church started at 7:30PM. I was awestruck by the church’s interior design. It was elegant and beautiful. There we sang praises to God, listened to the homily, said our prayers and asked for blessings and forgiveness of sins. The mass has ended after an hour. In a circle, my aunt thanked God for us, her nephews, for the blessings and prayed that we may be successful in life. On my turn I also thanked God for her, for helping us and for God to help her achieve her goals in life and give her strength and good health. It was such a delightful experience to have us pray for one another. Teary-eyed and happy at the same time. Magallanes Square was our last destination. For around thirty minutes of walking, we found out that our direction was wrong and we better ride a jeep to get there. Thanks to the locals for their guidance. Our choice of place to eat was at Diner’s Bulalo Restaurant. 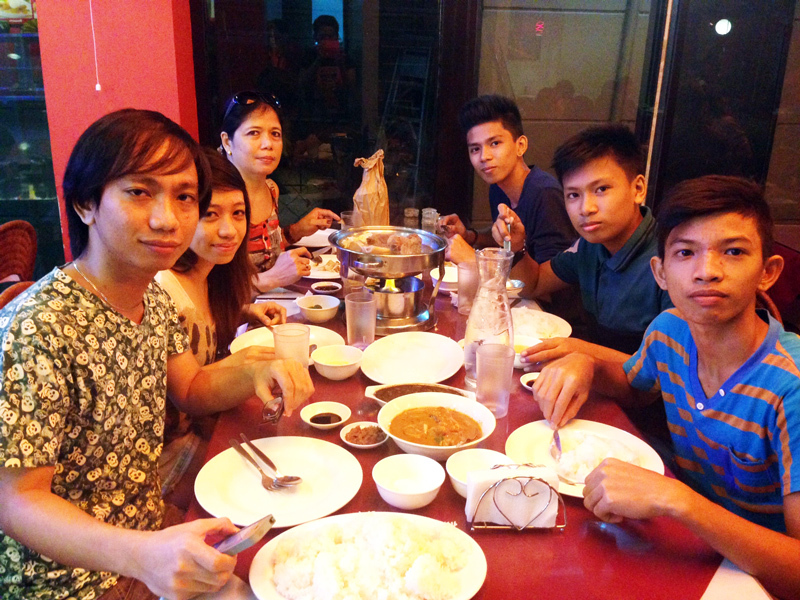 We ordered Kare-kare, Dinuguan, Bulalo, Lumpiang Sariwa and three platters of rice. All of the foods were tasty! Well, partly because we were all hungry! We left there with full stomachs and satisfaction with the food. Public vehicles were rare for it was already 11PM. We waited for a long time for a ride to come. The wind blows ice cold. Losing patience, I suggested that we ride the next jeepney going to terminal and wait a bus there. After a couple of minutes, a jeepney came and we hopped at once. We had already sat when a bus going to Pasay came. We immediately went down from the jeepney and then rode in the bus. I forced myself not to sleep so that we won’t go beyond Salitran. From Salitran, we rode a tricycle to Salawag then a jeepney to SM Molino. Fun experience. We flee from home secretly, only few of our family relatives knew! It was never really planned. We just left as soon as possible. 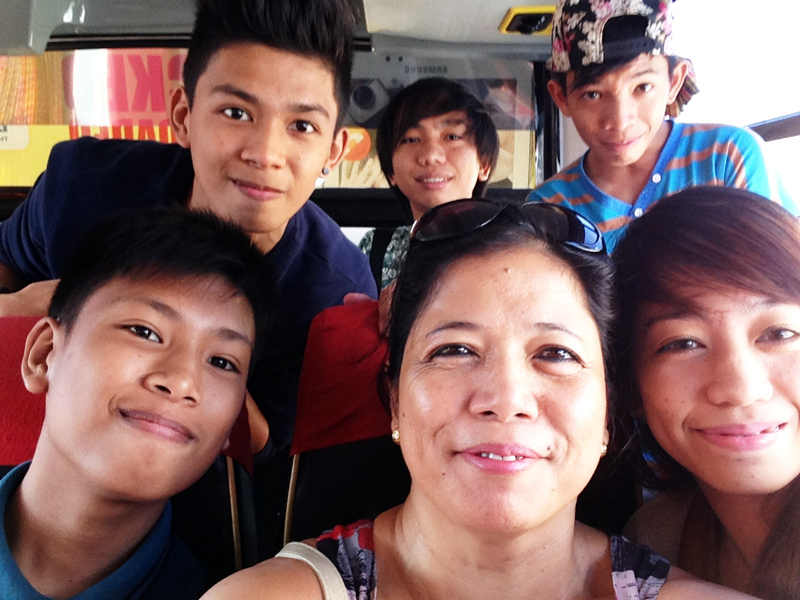 Me, my sibling, aunt and cousins’ runaway trip to Tagaytay. 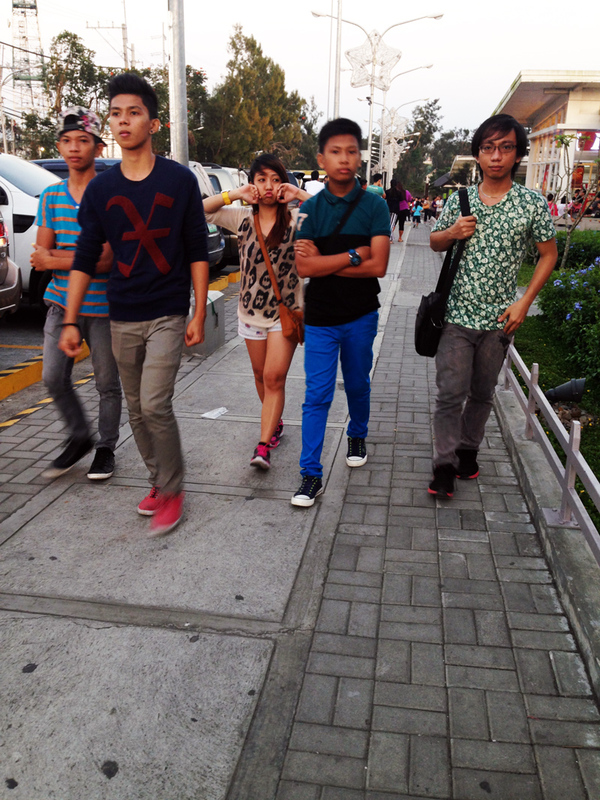 This entry was posted in People & Events, Space Travel and tagged family, food, tagaytay, travel. Bookmark the permalink.